P004: USE OF ELDERLY LIVER DONORS. RETROSPECTIVE SINGLE CENTER GRAFT AND PATIENT SURVIVAL. Coridalia Wald, MD1, Fuoad Souki, MD1, Alghidak Salama, MD2, Ernesto A Pretto Jr., MD, MPH1; 1University of Miami. Miller School of Medicine. Department of Anesthesiology., 2University of Miami. Miller Schooolf Medicine. Department of Surgery. Life Allliance Organ Recovery Agency. Introduction: The demand for organs far exceeds the supply prompting the need to use organs previously not considered ideal for transplant, such as those from older donors. Many studies report higher 1-year and 3-year graft survival rates among recipients of hepatic allografts from donors between 60-70 compared to those receiving organs from donors those >70 (1) (2). 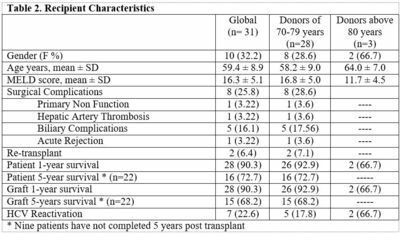 There have been few reports of outcomes among recipients of liver grafts from donors >80 (2) (3).We present outcome data on liver transplant recipients who received grafts from donors above 70 and 80 years old. Methods: We reviewed liver transplants performed between January 2005 and December 2015 at our institution. We analyzed only recipients who received a liver graft from a deceased brain donor (DBD) aged 70 and above. Donor demographics and cause of death were tabulated. We recorded and analyzed liver function tests (AST/ALT) in the first 30 days post transplant as well as the incidence of surgical complications up to 5 years after post transplant. We compared this data to recipients from donors <70 years old. Re-transplants, split transplants, and multi-visceral transplants were not included. Results: We identified 59 donors who met our criteria for age (70-84). Of these, 7/59 grafts were exported out of the local area and 12/59 not accepted for LT; 31/59 were transplanted at our center. Demographic data on donors is presented in Table 1. Demographic and survival data on the 31 recipients are presented in Table 2. Recipients of donors above 70 years had 25.8% surgical complication rate, survival in the first year of 90.3% and 68.2% five year survival. Conclusions: Our rate of surgical complication was superior to 20% of previous publications, (3) the survival rates are superior to the 1-year (83.9%) and 5-year (65.8%) patient survival among recipients with donor between 50-64 years of UNOS/OPTN database (4). The objective suitability of the best receptor for grafts from elderly donor is field for future research. 1. Orthotopic Liver Transplant Using Allografts from Geriatric Population in the United States: Is there Any Age Limit? Singhal, Ashish, et al. 2010, Experimental and Clinical Transplantation, Vol. 3, pp. 196-201. 2. Use of Octagenarian Donors for Liver Transplantation: A Survival Analysis. Ghinolfi, D., et al. 2014, American Journal of Transplantation, Vol. 14, pp. 2062-2071. 3. Using old liver grafts for liver transplantation: Where are the limits? Jimenez-Romero, Carlos, et al. 31, August 2014, World Journal of Gastroenterology, Vol. 20, pp. 10691-10702. 4. UNOS/OPTN Database. [On line] [Citated el: 22 de January de 2016.] https://optn.transplant.hrsa.gov/converge/LatestData/rptStrat.asp.